Our delicious cupcakes are made fresh to order using only the best quality ingredients. Cupcakes are great for every occasion from children's parties to weddings and look lovely displayed on our cupcake stand. 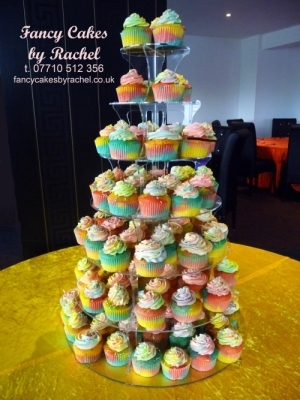 Rainbow cupcakes look amazing, the sponge of each cupcake is 4 different colours as is the buttercream topping. The toppings can be fondant icing or buttercream and decorated to your specification. Have a look at some of our cupcakes in the cupcake gallery for ideas. Cupcakes can be boxed individually, this works well for children's party bags. We have a cupcake stand for hire to display your cupcakes on. There is a minimum order size of 12 cupcakes.